Each 30.3g Serving Provides 25g of Protein, 5.2g of BCAA, & Zero Trans Fat. No Carbs, Sugar or any filler added. You get 100% Whey & Casein Protein Ingredients. 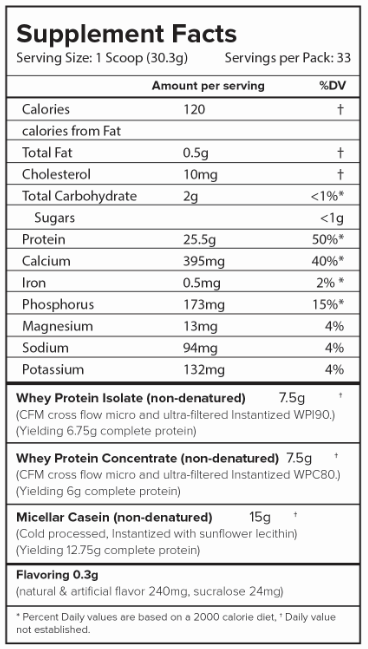 WHEY CASEIN BLEND™, As name indicates, Whey Casein blend™ is a blend of Whey and Casein protein. NUTRIJA™ WHEY CASEIN BLEND, provides 25% fast release WHEY PROTEIN ISOLATE, 25% medium release WHEY PROTEIN CONCENTRATE and 50% slow release MICELLAR CASEIN. NUTRIJA™ WHEY CASEIN BLEND, Each serving contains 25.5 grams of pure , complete protein derived solely from 25% fast digesting Whey protein isolate , 25% Whey Protein concentrate and 50% slow digesting Micellar casein . The Precise combination of Proteins Promotes Positive Nitrogen Balance And Elevates Muscle Protein Synthesis For Up To 4 Continuous Hours providing the perfect anabolic state for maximizing muscle growth and repair.